I like to make a chocolate buckwheat cake. It’s naturally gluten-free and not too sweet. With a little bit of powdered sugar and whipped cream, it is perfect! Pamela’s is my FAVORITE! the Baking and Pancake mix is my go-to item =) i have not gotten to try these new ones and am stoked to soon! Fancy! I’ll have to check these out either way – no time to back from scratch with the little munchkin learning how to crawl! Pamela’s Baking and Pancake mix is great. I make great pancakes with it and have also made the scones. I hope the new mixes are as good. My favorite homemade baked good is a GF peanut butter blondie. I brought them to a work party, and everyone couldn’t believe they were GF! The Pamela’s oatmeal cookie mix looks right up my alley! I am searching my mind trying to think of a homemade gluten-free baked good I have made, considering I only learned I have celiac disease about three weeks ago! But today I did make a batch of polenta, which is chilling in the fridge, and which I plan to grill on the barbecue later this evening then sandwich around delicious slices of smoked gouda and crispy bacon to serve with creamy tomato soup for dinner! 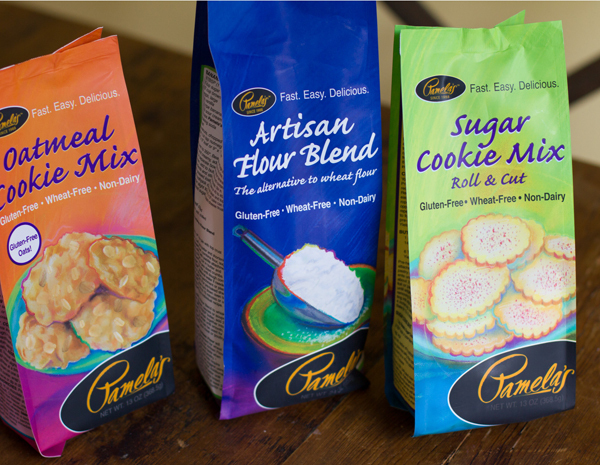 I love Pamela’s new biscuit mix. They are very tasty. Would love to invite you to the Morinaga Mori-Nu Tofu booth at Expo West. Are you attending again this year? Mori-Nu tofu is non-GMO, and gluten-free of course! We are making some tasty samples at the booth and would love for you to stop by. I’m sorry, I couldn’t find your email anywhere on the site.